Martin Shkreli, the founder and CEO of Turing Pharmaceuticals, is under fire for his role in the price hike of a drug that treats life-threatening parasitic infections and helps AIDS and cancer patients. The internet, along with doctor and patient advocates, expressed outrage over the move, describing it as greedy and exploitative—coming at the expense of those who are already suffering from serious health problems that require costly treatment procedures. In the aftermath of the news report, this one image has gone viral. 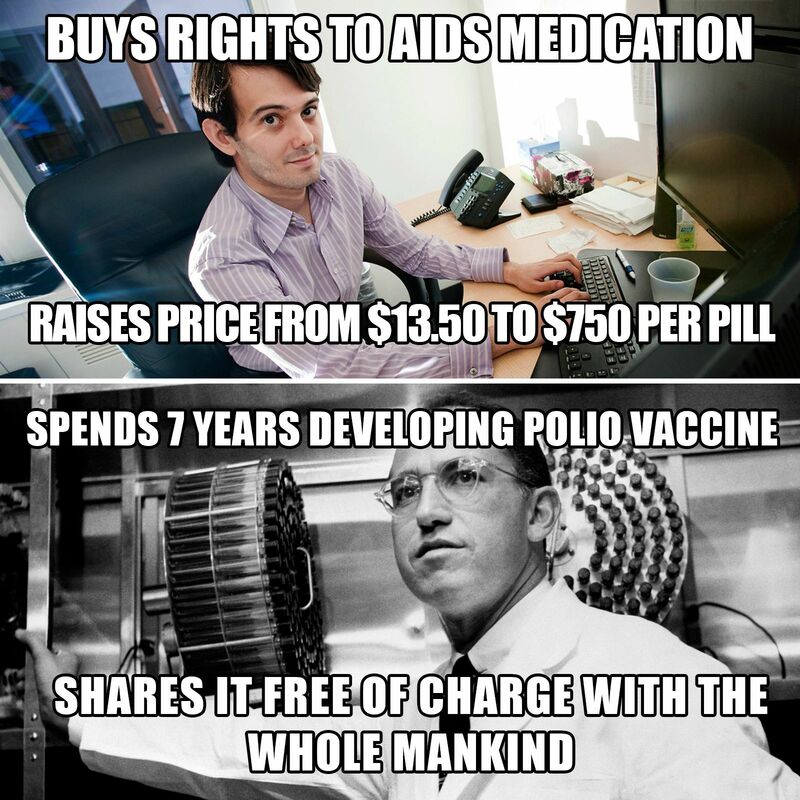 This meme shows why criticism of Shkreli is so extreme. The top image shows Shkreli, a former hedge fund manager who runs the startup Turing Pharmaceuticals, which acquired Daraprim, a 62-year-old drug that treats life-threatening infections and helps support the immune systems of AIDS and cancer patients. Immediately after the deal was finalized in August, the company raised the price from $13.50 per tablet to $750—a 5,000 percent increase that would up the annual cost of treatment to the hundreds of thousands for some patients. Sure, he stands to profit tremendously from drug sales, but Shkreli argues that the price hike is really about increasing patient access to the drug and raising money so that "the company could reinvest in research into a new drug for the condition," the Washington Post reported. The bottom image shows Jonas Salk, the medical researcher and virologist who spent seven years of his life developing a vaccine against polio, an infectious disease that was previously regarded as one of the most frightening and uncontrollable in the world. Annual epidemics made headlines and prompted fear in the public. Salk was successful in his efforts and came out with the vaccine in 1957; he supported mandatory vaccinations across the world, putting public health before profits. When he was asked who owned the patent for his vaccine, Salk famously said that there was none. "Could you patent the sun?" he responded. Whereas Salk felt a "moral commitment" to champion vaccination efforts globally, Shkreli has expressed no sense of regret over the likely financial and public health consequences of raising the cost of Daraprim. "The Infectious Diseases Society of America and the HIV Medicine Association sent a joint letter to Turing earlier this month calling the price increase for Daraprim 'unjustifiable for the medically vulnerable patient population' and 'unsustainable for the health care system,'" the Times reported. Though they have both held enormous influence over the future of public health in the world, Shkreli and Salk appear to be far removed from one another in terms of their philosophy of medicine.